Emergency Medical Services, Police, Military, etc. Military, law enforcement, and emergency medical service (EMS)/medivac operations often require temporary or portable helicopter landing zones (LZs or HLZs). In addition to its other uses, the PowerFlareTM Safety Light product serves as a superior LZ system, obviating the need for a separate LZ kit. Click here to see actual video of a PowerFlare LZ. Areas, vehicles, personnel, etc. can also be marked using visible or infrared PowerFlareTM units. Using Infrared-version PowerFlareTM units, tactical operations can be conducted using FLIR and night-vision systems. 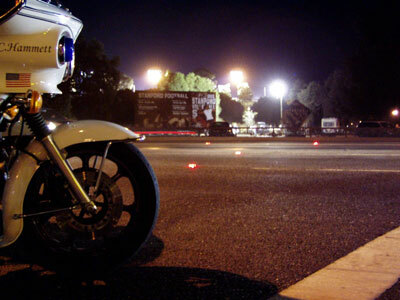 Because the light output is angled and diffused, the pilot's night vision is less likely to be impaired (a common problem with strobes or other such products). Because the PowerFlareTM light output is focused parallel to the faces of the unit, there is no need to dim the light when the aircraft makes it approach or hovers above the LZ site. PowerFlareTM units can be seen for over 5 miles from the air. PowerFlareTM units can flash over 24 hours and recharge quickly to be ready for the next use. PowerFlareTM units automatically activate when removed from the charger, allowing quick deployment at the LZ. PowerFlareTM units are about the size of a hockey puck, reducing their vulnerability to rotor wash and wind. 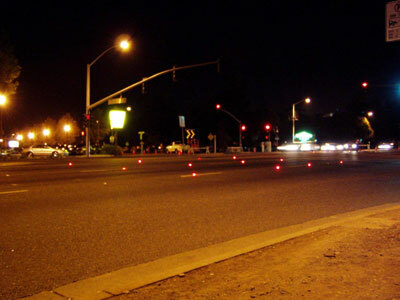 PowerFlareTM units can be used for traffic control, as a warning light, as a rescue beacon, and so on. 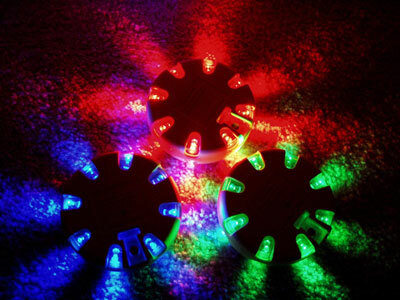 Because they are watertight and non-reactive, they can be used in places where old-fashioned flares would be dangerous, such as in dry brush. Plus, you are sure they are always ready to go. 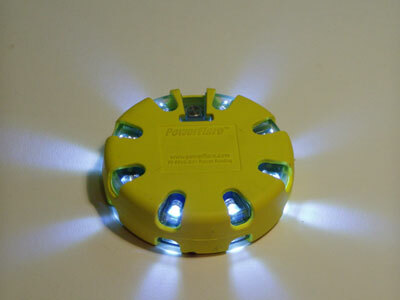 PowerFlareTM are rechargeable, so you don't waste money on batteries. 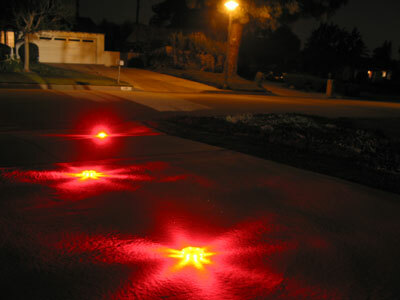 "We have experienced many landings now with PowerFlare Beacons as the LZ and have found them to be superior to anything else we've seen or used. Recently, during a landing in Morgan Hill, the pilot reported seeing the beacons flashing from over 5 miles out. 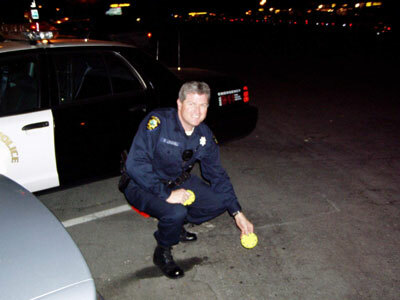 They give a dependable, accurate target that is needed when responding to emergency situations." Click here to read the entire letter of recommendation. To place an order, please visit our purchase page. See photos of PowerFlareTM units in action. Click an image below to enlarge. Watch video of PowerFlareTM units in action. If the video will not play, you may need to install the DivX codec. Download a .pdf file of the PowerFlareTM Helicopter overview. If you cannot view this file, you may need Acrobat Reader. Copyright © 2003 PowerFlare Corporation. POWERFLARE, the PowerFlare logo, and "By First Responders for First Responders" are trademarks of PowerFlare Corporation. All other marks are the property of their respective holders. Specifications subject to change without notice. Pat. Pending.